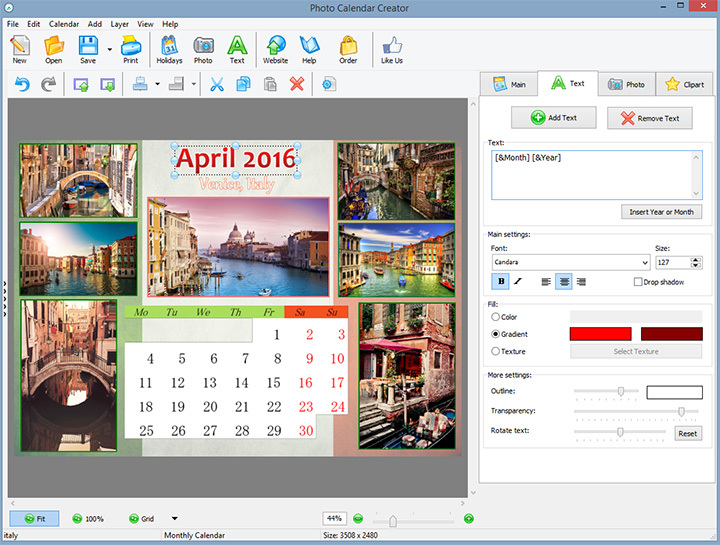 Photo Calendar Creator is an award-winning application for creating professional-quality printable calendars. Rated among the top three calendar creators by Top Ten Reviews, this software provides all the tools you may need for designing original calendars of any type: wall poster, spiral-bound, booklet, pocket, folding desk calendars, weekly or monthly planner, and even lunar calendars for any year and month. The program is also perfect for creating corporate and promotional calendars with logo and slogan. The software lets you create calendars in any language of the world thanks to Unicode support and the built-in Language Editor. The program interface is available in several languages, including English, French, German, Spanish, Italian, Portuguese, Dutch, Czech. There is also a database of national holidays for different countries with holiday dates up to 2020; you are free to add your own holidays and special events. Thanks to the convenient interface, creating stylish calendar layouts is easy and fast, even for novice users. Choose among 150+ design templates or create your own custom layout with the calendar wizard. You get ample opportunities for using images for the calendar design: Photo Calendar Creator lets you set a photo as calendar background, add single photos or a photo collage to the calendar, and even insert pictures into the month grid cells. There is a handy set of editing tools: crop, rotate, enhance photos, add border or shadow, change transparency, manage layers etc. On top of that, you’ll find a selection of stylish picture frames, 60+ masks for fancy edge effects, and a huge clipart gallery. Export options include optimized JPEG, PNG, PDF, TIFF (CMYK), and PSD. The software allows you to print calendars in professional quality with 300 to 600 dpi resolution.